Planet Kids is a premier preschool chain, started by ‘edupreneuers’ with a combined experience of over three decades. World-class learning environments that foster creativity, coupled with a scientifically researched curriculum, make a child’s first out of home learning experience truly wonderful. 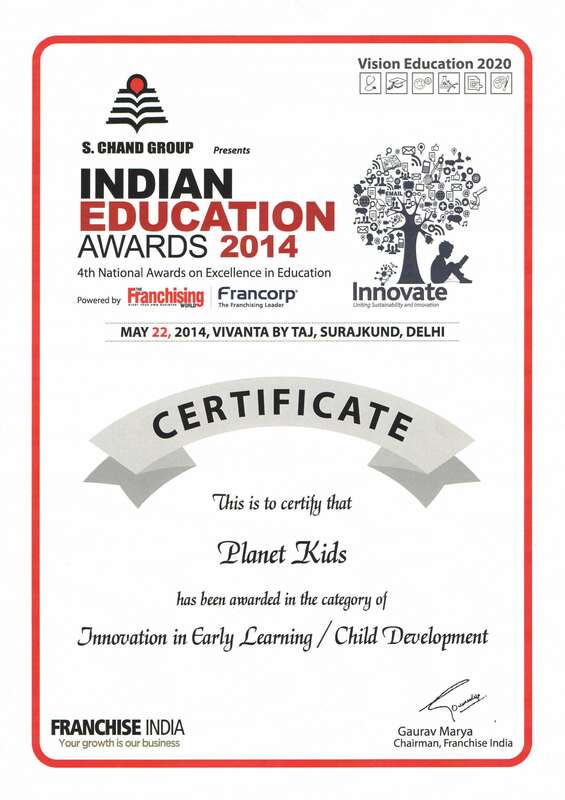 Today, Planet Kids is a name synonymous with high quality education and excellence. Planet Kids was established in 2005 with a vision to enhance the quality and experience of pre-schooling at Bangalore. It has been a pioneer in the pre-schooling industry when it comes to creating excellent stimulating learning environment. Here learning is truly the fun way for the little ones. We have created an indelible impression in the pre-schooling industry with-in a very short span of time, which in some cases have become benchmarks. We have also been the proud recipient of the prestigious Indian Education award 2014 for innovation in early learning / child development. There are international standards for all the working methodologies and are renowned for the innovativeness in providing a 360 degree holistic experience for the children as well as the parents. This effort has helped them reach out to thousands of parents who have been very meticulous in providing quality education to their children at an affordable fee. We at Planet Kids have been successful in creating spaces where kids grow up to be confident and take pride in everything they do. Which is why we did not just create preschools but created ‘Centers of Excellence’. These centers provide a wholesome experience for the kids that include everything that is required for them to be all round achievers. The environment at the centers are extremely enriching and very different from the monotonous atmosphere of a school which teaches just ABCs.. Planet Kids believes that each kid is unique & special. It is our endeavor to work on the innate talent and abilities of each kid, and nurture them into beautiful individuals. We believe in encouraging curiosity, imagination and creativity as a means of learning. Through everything we teach, we wish to create a strong foundation, not just for academics but also for life. "Nurturing young minds to build self-esteem, individuality, a healthy lifestyle & a value system by creating a happy, caring and simulating environment where children develop a love for learning"
To create leaders of tomorrow by shaping young minds of today. It is our vision to expose kids early on to holistic development skills, nurture healthy habits and lifestyles, build their individuality and self-esteem, inculcate learning for a lifetime and yet maintain firm roots in our values and culture. To pioneer new developments in the preschool industry. It is our endeavor to lead the early education segment with our innovations, creative methods of teaching, scale of activities and integration with newer and more progressive pedagogies, constantly. After a successful start in the garment industry in 1998, Amar’s journey as an entrepreneur brought him to the preschool segment in 2002. 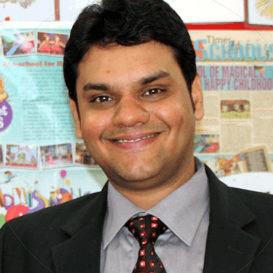 Amar was instrumental in conceptualizing Planet Kids. His innovative ideas and creative mind have always set the bar high for everyone. His dynamic personality, ability to sell and out of the box thinking have helped take the business places. He is an active member of various child development forums, and was also a guest speaker at the National Franchise Forum. A doting father, avid quizzer, biker, music aficionado, and a perfectionist, he juggles the various facets of his life successfully. Mr. Jain started his journey as an entrepreneur when he launched computer labs, Computer Business Management (CBM), across Karnataka in 1996. Through this, he even published and distributed books on computer sciences to schools across the country. In 2004, he took over the management of Florence High School, Bangalore, and has since then successfully managed the school. Today, he is on the advisory boards of many schools across Karnataka, and is associated with various charities related to educating underprivileged children. He is a man of many interests, ranging from real estate to travel, from politics to planning. 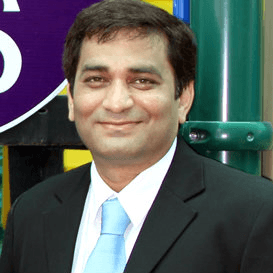 He brings his sharp business acumen and financial genius to Planet Kids, and has played a prominent role in helping the chain catapult to success in a short span of time. 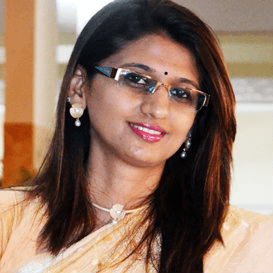 Bijal has been the Planning and Academic Head at Planet Kids since many years now. She has been the backbone of the teacher training initiatives. Known for her innovative approach to child development, she has used her skills very effectively to make learning fun. Her calm and pleasing personality makes her a favorite with the staff. She is responsible for integrating newer teaching pedagogies, creating a hands-on approach to teaching, enhancing the quality of teachers and improving the overall learning experience for the kids.